A previously unheard Jimi Hendrix song appeared on the web today called "Somewhere," and there was no way I couldn't share this as he is not only one of my favorite guitar players, but might be the greatest of all time. This track was recorded back in 1968 during the time that he was working on First Rays of the New Rising Sun. 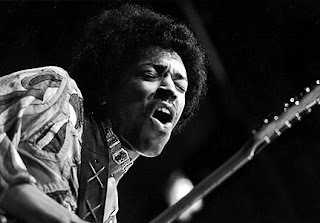 The song is pure Hendrix from beginning to end and is what you love about the rock n'roll legend. "Somewhere" and 11 other tunes are set to be released on a compilation called People, Hell and Angels, which is due out March 5. Since the player will not work until tomorrow, you can stream it at Rolling Stone.